Check gold rates in your city below. Dollar dynamics – Generally, gold is used as a hedge against movements in the US dollar which means gold prices are inversely proportional to changes in strength of the US dollar. When the US dollar strengthens, gold prices in India tend to fall and when US dollar weakens, gold price rises. Import costs – In India, huge demand for gold is primarily met through gold imports, which means that import rates affect the price of gold within the country. Higher the cost of imports, greater will be the prices of gold. Interest rates on banks fixed deposits – Fixed deposit of banks is the most popular investment option chosen by millions of Indians after gold. When the FD rates fall, investors prefer to invest their money in gold as an alternative investment option. Therefore, when the demand for gold rises, the price of gold increases too. Economic stability – The price of gold generally rise at the time of global economic crisis, as gold is considered as a stable asset to invest upon compare to the other riskier assets. Investors tend to pull their money out of riskier investment and invest into gold. Also, gold has higher liquidity which continues to hold value at the time of instability also. Seasonal price – In India, demand for gold increases during auspicious occasions, festivals and marriages. The demand for gold rises, hence the price also rises due to the increased demand. Inflation – Gold price in India increases at the time of inflation. Since gold is bought to hedge against inflation, gold prices tend to rise when inflation is on upward trend. Demand-supply – Domestic production and supply of gold is limited in India. Major constraints in the global supply of gold tend to raise the price of gold. Similarly, when there is a decrease in the supplies of gold globally, it makes the metal price dearer in India. International prices – When gold prices increase in the international market, the price of gold in India also tends to increase as well. For example, when the central banks specially in US and Europe buys gold as a hedge against inflation, the price of gold moves upwards globally. Why Gold Rate varies across different cities in India? Local Taxes – The local tax rate differs from state to state. Some states levy higher taxes on gold than the others. This is one of the main reasons why gold is more expensive in some cities. Gold Associations – Local gold associations have enough power to fix the gold rates. It is true in case of larger cities including Mumbai and Chennai. Due to this reason, the price of gold changes from one city to another. Quantity of gold purchased – Purchasing gold in larger quantities tend to decrease the price of gold. Therefore, in larger cities where larger volumes of gold are purchased, gold prices tend to be lower. Transportation Costs – India imports most of its gold by sea. Probably this is the least important factor, but the transportation of gold from one location to another requires tight security arrangements and such expenditures potentially affect the gold prices locally. What are the various gold options available to buyers in India? Physical Gold Jewellery/Bars and coins – The primary method by which most of the Indian household’s purchases and store gold is in the physical form of gold jewellery, gold bars and gold coins. Investment in gold has become questionable after other forms of gold investments came into effect. Gold Exchange Traded Funds (Gold ETFs) – A gold ETF is an electronic form of purchasing gold used to track the domestic physical gold price. They represent physical gold in dematerialized form. One gold ETF unit is equal to 1 gram of gold and is backed by physical gold of very high purity. They are usually traded on the National Stock Exchange of India (NSE) and Bombay Stock Exchange Ltd (BSE).When you redeem gold ETF you don’t get physical gold but the cash equivalent. Trading of gold ETFs takes place through a dematerialized account (Demat) and a broker, which makes it an extremely convenient way of electronically investing in gold. Gold Mutual Funds – Gold mutual funds are like open-ended funds. Investors may invest any amount of money at any time. The process of investing in gold mutual fund is easier than gold ETFs as it does not require a demat account. Investors can also use the SIP (Systematic Investment Plan) route to invest in gold funds, which is not possible with gold ETFs. Sovereign Gold Bonds (SGBs) – SGBs are government security gold bonds denominated in grams of gold. They are used as substitutes for holding physical gold. Investors will have to pay the issue price of the bonds in cash and it will be redeemed in cash on maturity. These bonds are generally issued by Reserve Bank on behalf of Government of India. Always check the purity of gold – One should always check the purity of gold at the time of purchasing gold jewellery. The easiest way to check for purity is to look for BIS hallmark. A hallmarked piece of jewellery will tell you the official proportion of the metal. Avoid purchasing stone-studded jewellery – Always try to avoid purchasing the jewellery studded with precious or semi-precious stones than a simple gold piece because you are paying more than it’s worth. Always check the exact net gold weight before buying the stone-studded jewellery. Cross check the gold pricing – Always ensure to cross check the gold prices before visiting the shop for purchasing gold jewellery. The price of gold keep changing from day to day based on the market rate. All jewellery stores display the daily bullion rates for the consumers to calculate the gold price Avoid selling to other jewellers – Always ensure to avoid selling your jewellery to other jewellers from which you have not purchased because they may cheat you by not telling the exact resale value of your jewellery. So, it is always better to visit the same store to know the exact resale value. What is the Difference Between 22k and 24k Gold? 24-karat gold – 24-karat gold is also known as pure or 100% gold, this form of gold has no trace of other metals and known to be 99.99% pure gold. This form of gold is superior to 22-karat gold and is slightly more expensive. 24-karat gold bars come with a guarantee resale, due to the high liquidity and demand of gold in the market. 22-karat gold –This form of gold is 91.67% pure and it also contains two parts of alloyed metals like silver and copper. This gold is commonly marketable in ornamental form and is cheaper than 24-karat gold. Examine the jewellery – When you are looking out for selling your gold jewellery, always try to check the stamp put by the reputed jeweller with its purity data by placing it under magnifying glass. Look for the BIS Standard Mark - BIS is the benchmark for purity standards for gold in India. Every jewellery item will carry its own BIS standard mark. Approach a jeweller – If you are unable to figure out the exact purity of your gold on your own, it is advisable to visit a jewellery showroom to get your piece tested. How much gold are you getting for your money? Usually at the time of purchasing gold jewellery, several additional charges are also levied from the customers such as making and wastage charges. So, before making the actual payment, ensure that you know the value of the gold you are buying. Why you should buy gold? Gold has always been considered a good and safe form of investment in India. Gold are used as a hedge against funds during the time of economic instability. Investors tend to maintain at least a portion of their assets in the form of gold as they are highly liquid in comparison to other riskier assets. What is the impact of GST on Gold? With the implementation of GST on July 1st, 2017, a uniform GST will be applicable to gold transactions across India, which is likely to reduce the interstate differences in prices of gold significantly. The move is likely to bring more transparency for its buyers and tax across any arbitrage opportunities. The government has introduced a GST tax rate of 3% on gold. Nowadays, almost all banks offer attractive schemes on Gold Loan at competitive rates with many customer friendly features. 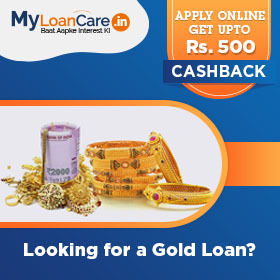 You can do rates comparison, check your eligibility, calculate EMI, apply online and get the best Gold Loan rates. 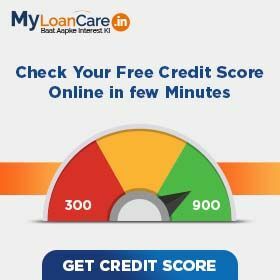 MyLoanCare helps you throughout the loan process from the day you apply to the time you get disbursement. You can register with us, track your loan status on a regular basis and get an option to earn attractive cashbacks and refer and earn benefits.